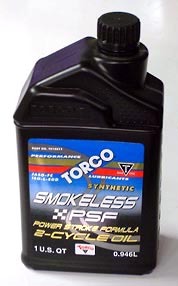 A high quality nearly smokeless synthetic oil for use in mildly tuned road-going scooters. Use at a ratio of 32:1 (4 oz. per gallon of gas) in Series 2 and later machines.